When determining effective service provision for children who are hard of hearing or deaf (HH/D), the primary care physician (PCP) must consider differences in variables such as the family’s ethnicity, education, religious and cultural beliefs, and family structure. These decisions are further complicated by the high degree of heterogeneity of children who are HH/D. The PCP must also consider the child’s hearing loss, hearing status of the parents, and parents’ choices for communication modalities of the child. The Hearing Status of Parents: For children who are HH/D to achieve their full potential, it is important that they have consistent access to fluent language models as early as possible. We have known for decades that the specific language is not nearly as important as the fact that children are consistently exposed to a rich language environment from the time they are born (Hart and Risley, 1995). 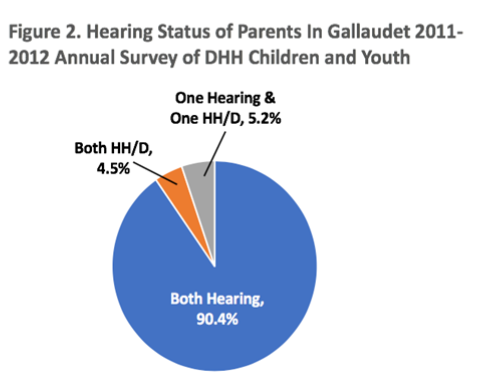 According to Gallaudet University’s 2011-2012 Annual Survey of Deaf and Hard of Hearing Children and Youth (which included mostly children who had moderate or worse bilateral hearing losses), less than 5% of children and youth in that sample had parents who were HH/D (see Figure 2). Thus, for the vast majority of children who are HH/D, their earliest language environment is one of spoken language. For families who chose to use visual language such as American Sign Language (ASL), it is important that as many family members as possible become fluent in ASL so that the child has fluent and consistent language models during this important developmental period. Although research evidence is sparse, available data suggest that most HH/D children who are raised with fluent ASL do just as well as HH/D children who are raised with a spoken language such as English or Spanish. Gallaudet Research Institute. (2013, August). Regional and National summary report of data from the 2011-2012 Annual survey of Deaf and hard of hearing children and youth. Washington, DC: Gallaudet Research Institute. Hart B, & Risley, TR. (1995). Meaningful differences in the everyday experience of young American children. Baltimore, MD: Paul H. Brookes Publishing Company.